You can purchase three Kids' Wings Biographies for Just Being Audrey (11 pages), The Life of Louisa May Alcott (9 pages), and The Extraordinary Mark Twain (10-pages) NOW for immediate download for only $12.95! Click Here to purchase and download. Everyone loved Mark Twain! They attended his lectures. They read his books. They laughed at his funny quotes. But, Mark Twain's 13-year-old-daughter, Susy, was annoyed that so many people thought they were Mark Twain experts. She knew she was the one who knew Mark Twain the best, so she undertook to write his real biography in her secret journal. She watched him as he went through his days, writing about his appearance, his personality, his good and bad habits, and the funny things he did. Susy Clemens became his biographer. Now, pages of her biography of her papa, Samuel Clemens, are cleverly embedded within the pages of a picture book about one of the most famous authors of all times. 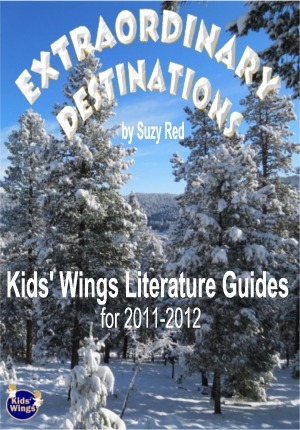 The Kids' Wings literature guide invites group discussion, prediction, drama, problem-solving, and skill building. Teachers who want students to understand history through the eyes of one who was there will want make this intermediate-level picture book part of their classroom libraries. Was Huck Finn a Racist? The Extraordinary Mark Twain is one of the 26 literature guides for award-winning literature in our Extraordinary Destinations Collection. Though you can order each unit individually for about $12.95, if you order Extraordinary Destinations you will get the 26 units for less than $1.00 each in a spiral-bound book with CD in its back pocket! Order now while we still have them to send to you!